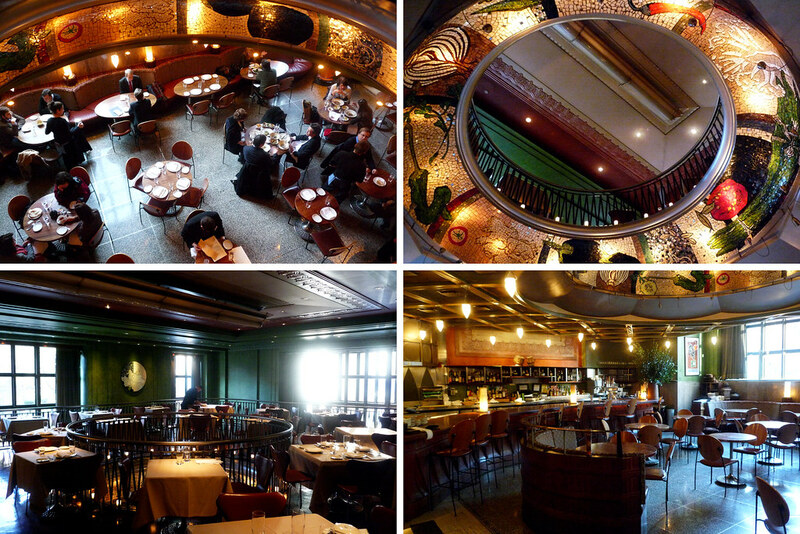 In this solo dining adventure, Gary visits Tabla one final time before it’s gone forever. In the 11 months this site has been live, this has to be the toughest review I’ve ever had to write. Not because of the quality of the food but rather the fact that this restaurant won’t be around much longer. Tabla was one of the restaurants that had been on my to-do list pretty much since we started this site but not one I really felt I had to rush out to eat at. Chalk it up to a perceived invincibility I thought the place had. It is, after all, a Danny Meyer restaurant and his restaurants just don’t close up shop. Ever. It’s never happened. Until now. When it was announced on September 30th that the place would be closing at year’s end, I was actually out of town, in Seattle, but even restaurant folks I spoke to out there had heard and were shocked it was closing. Yeah, it wasn’t exactly the most popular or most jam-packed of the USHG restaurants – it’s just too big a place for Indian food, no matter how delicious chef Floyd Cardoz makes it – but you had to figure that Meyer would find a way to keep it going somehow. Alas, they would not be pulling the proverbial rabbit out of a hat (tandoor, maybe?). Before it closes for good on December 30th, I just had to get one more shot at the place, choosing to do so during lunch on a nice December afternoon. A quiet one too with more than half – close to 75% – of the restaurant’s dining area empty. Granted, it was near the end of lunch service but I didn’t think it’d be that empty. Just some visual evidence of just how hard it is to fill 280 seats, especially in this economy. After placing my order, the standard complimentary order of Rosemary Flatbread was sent to my table. 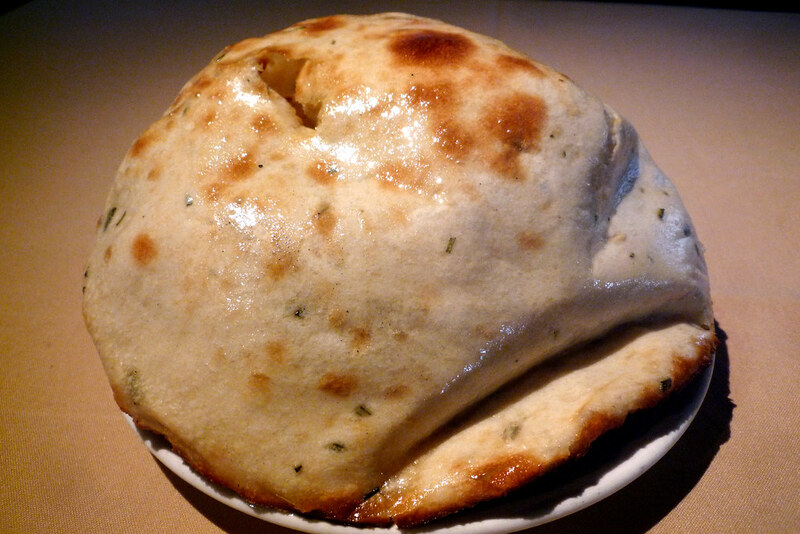 Yeah, it’s basically standard issue naan with some rosemary in the dough. It arrived at my table inflated with more hot air than any bloviating United States congressman I’ve ever seen. There’s also a nice, greasy sheen on top from what smelled to me like butter. The top half is incredibly doughy while the bottom has a cracked, crispy finish – both more so than I normally find in my naan. Good rosemary flavor and an all-around solid naan. From the $32 prix fixe three-course option, I chose to start with Tabla’s Crab Cake which comes atop a layer of Goan guacamole, encased in a papadum and tamarind chutney on top. 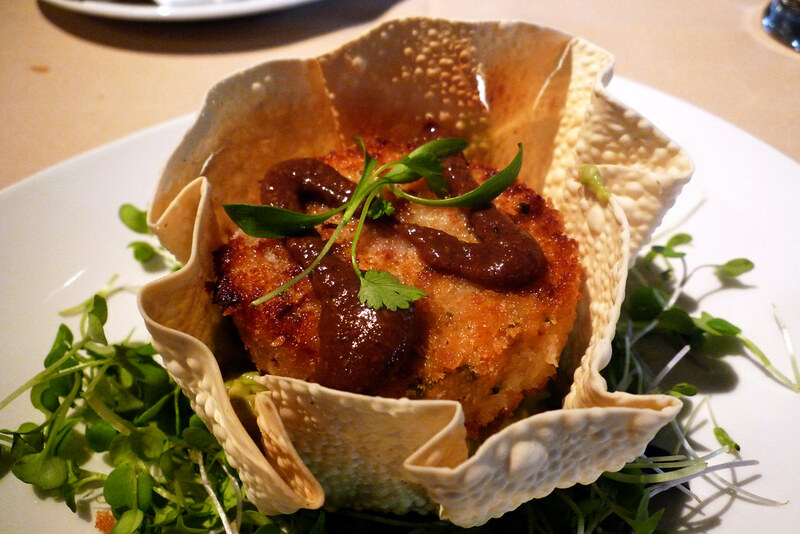 A really good crab cake – plenty of crab meat and fried just right. Surprisingly, it goes well with the guacamole. My favorite bites from this dish came when I had a forkful of crab cake, papadum, guacamole, the chutney, and the greens underneath the papadum – a little bit of everything. My only wish was that the dish was spicier – the chutney helped some but not in a way that packing the actual crab cake with more spices would have. 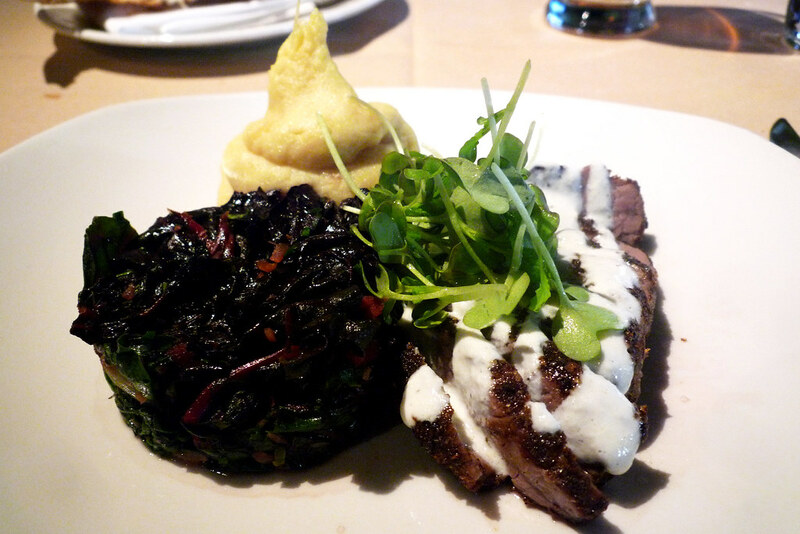 For my entree, I went with the Coriander & Mustard Crusted Flank Steak which has some horseradish raita drizzled on top. It also comes with mustard mashed potatoes and some sauteed, bitter leafy vegetables. Sadly, my flank steak came out a little overdone – the center was more brown than red – but the flavor was there though it’s possible it was amped by the potent horseradish raita. The decent-sized portion of steak, coupled with the mashed potatoes and sauteed vegetables definitely left me full. I think I might have enjoyed the mashed potatoes more than the steak – they weren’t overdone, just a nice smooth texture and plenty of mustard/horseradish flavor. I ended the meal with the Mango Ice Cream Sundae. The ice cream sits atop a brown butter crumble with a spiced caramel sauce drizzled atop the scoops of ice cream while hazelnuts and meringue dots are sprinkled all around it. A crispy piece of mango stuck inside a ball of whipped cream finishes off the dish. 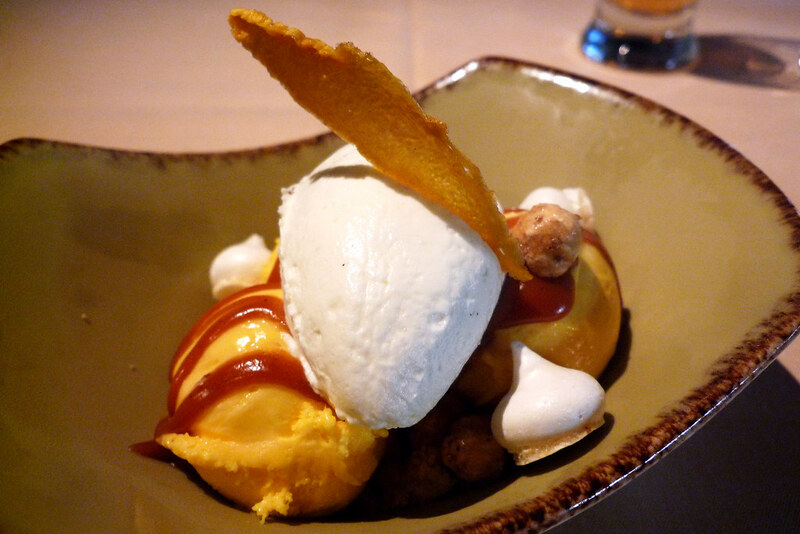 A good dessert with the mango ice cream packing pure mango flavor with the crunch of the hazelnuts and meringue providing a nice textural contrast. Altogether, Tabla puts out a good, solid meal that showcases the sort of things chef Floyd Cardoz likes to do with his native Indian food. The only problem really is that there’s nothing here that’s so spectacular that I’m going to stop going to another, less expensive Indian restaurant which I suspect is the crux of the problem for them and why they were unable to stay open in the long run. It’s still worth a visit, even once because this is a Danny Meyer restaurant we’re talking about after all – the service, the quality of food, and the space here all meet his group’s standards and that’s enough to merit one visit before they’re gone come December 30th. Tabla. 11 Madison Avenue, New York, NY 10010. [Show/Hide Map] (212) 889-0667.